Video killed the podcast star: New PowerCLI training from TrainSignal! Many of you are familiar with Hal Rottenberg, who is the co-host of the PowerScripting Podcast along with Jon Walz. 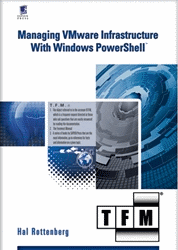 Hal’s resource is a great resource for anyone learning or using Windows PowerShell. You may also recall that Hal is the guy who wrote the “PowerCLI Bible”, Managing VMware Infrastructure with Windows PowerShell. Well Hal’s been hard at work again this time producing some great PowerCLI content for TrainSignal in their newest video training series, vSphere Pro Series Volume 1. We’re finding that the admins who know PowerCLI really well are the rock stars of their team because through their script-writing kung fu they save their team mates tons of time and can easily come up with solutions to most any crisis. These videos will put you directly on the path to PowerCLI mastery. As a big bonus, those of you who were paying attention at VMworld 2009 will also remember that VMware View is soon going to introduce its own set of PowerShell functionality, so if you’re a View expert there’s no better way to get ready for the new power and flexibility you’re soon going to have. So be sure to visit TrainSignal and check out Pro Series Volume 1 today! This entry was posted in Uncategorized on February 12, 2010 by Carter Shanklin. vedant on How to run PowerCLI scripts from vCenter Alarms.